My experience with Virginians Twisted Tower Dire has been a bit sporadic. I have a pair of their first albums on Miskatonic Foundation and thought they were decent 80s metal albums very much worshipping Iron Maiden. Somehow, however, those works did not inspire me into pursuing every album Twisted Tower Dire released ever since. Then, on some news site, I read that the band’s vocalist Tony Taylor tragically passed away in a motorcycle accident and frankly thought that Twisted Tower Dire was over. 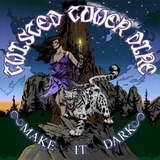 Despite the odds the band persevered, and is releasing a new album Make It Dark on Cruz Del Sur with a new vocalist Jonny Aune from North Carolina thrashers Viper. Time may have gone by and the vocalist may have changed, but Twisted Tower Dire is plowing the same waters they began navigating back in mid-90s. They are still playing traditional 80s style metal, all trends be damned. Slightly faster than mid-pace, but not speed metal blazing, the band relies on quality twin guitars by Scott Waldrop and Dave Boyd and simpler song structures with repeating parts, like in Snow Leopard. Raising the tempos at times (The Stone), the duo of guitarists can also indulge themselves in spot-on laser-sharp melodic solos (White Shadow). As much as traditional 80s metal could have originated in Europe, Make It Dark has a distinct American flavor. Not as progressive as the first Crimson Glory works, and perhaps due to the higher pitch of Jonny Aune’s vocals, Make It Dark, in spots, reminded me of King Kobra, the band I first heard as a teenager in 1985. In fact, with titles like Snow Leopard and a little silly, jumpy tune The Only Way, there is a hint of glam and spandex here, but it is very slight. The sound on the album is purposely not very polished, bearing old studio warmth, suffering a bit from the drums being slightly plasticky and buried deeper into the mix. Throughout the album’s eight cuts the band can’t be accused of resting on its laurels, working one song after another, as if in one-breath live performance. I would be the last person to advice somebody on a ballad, but it feels that some change of pace would not have hurt on Make It Dark. Although not overly taken by the album originally, given time (and doing lots of driving) I have warmed up to its non-complicated listening pleasures. This album is truly one for the road, as it just keeps on rolling non-stop. My favorite moments are anthemic title track, where Jonny Aune pushes himself at the end and the super-melodic White Shadow, although I can see many falling for the opening shot Mystera as well. Twisted Tower Dire and Cruz Del Sur is a perfect partnership, as this Italian label knows how to promote the metal style played by these less known American veterans of the genre.